You could make a huge difference in young Thai student's life by supporting the Bangkok Post Foundation (BF). Established in 1982 with an initial funding by the Post Publishing Company Limited of a sum of Baht 500,000.- , this Foundation has so far provided 2,677 scholarships to needy Thai students and orphans and has helped to rebuild a school that was completely destroyed when Typhoon Gay devastated southern Thailand in late 1988. When Tsunami swept through some provinces in southern Thailand in 2004, the Foundation has also provided scholarships to 35 orphans whose parents were killed or missing. In 2012, the foundation also helped rehabilitate seven schools in the central region that were flooded. 2. Send a cheque payable to "Bangkok Post Foundation"
To promote education and the educational activities of needy school and university students. To promote education and research work for the press. To cooperate with other charities for the public interest. Since the beginning of 1998, the Foundation has been concentrating its efforts on carrying out, as best it can, its first objective. In line with this, the Foundation is currently funding the education of 234 students from primary to university level nationwide. Additional funds are needed to continue this work since all recipients will receive the support from the Bangkok Post Foundation until they could complete their highest education. The Foundation's initial funding, prompted by stories the Bangkok Post ran on the devastation in November 5, 1988, came to 800,000 baht (approx. US$ 25,000). Since then, more donations have been made increasing the fund to approximately 36 million baht. Starting with only five students in1990 the number of students was also increased proportionary until the numbers now reach 234 in 2015. A strong academic result is not the main criteria for choosing students to sponsor but they should at least be able to pass their examination. Funds given to these students are derived purely from donations and interested earned. The scholarships will be given to recipients continually until they finish their education. Before allocating funds to individual students, staff members and volunteer from the Foundation visit the children's homes and speak to their teachers, parents or guardians or even their neighbour in order to determine whether they genuinely need assistance. The Foundation is always looking for needy students to sponsor. We are already sponsoring students from the northern, northeastern, central and southern regions of Thailand, and as with our fund growing, we are now able to include students from the western as well. Our ultimate goal, of course, is to be able to sponsor students from all regions of the country as our fund increases. At this point in time, the Foundation is in the process of embarking on a fundraising campaign to increase earnings which would enable the Foundation to increase more assistance to existing students whose education expenses continuing to rise every year, as well as, to expand its assistance to more students throughout the country. We are committed to this drive despite the current economic crisis gripping the world. There are far too many rural Thai students facing severe hardship for us to give up this worthy cause. In November 1988, a devastating typhoon gay blew through the south of Thailand. It destroyed vast areas. One of the worst hit was the little village of Ban Sapli in Chumphon Province. The typhoon killed over 500 people and destroyed many houses and over a hundred schools in the area as it roared through. Among the buildings razed to the ground was the little Ban Sapli School which was reduced to rubble. The news shocked readers who wanted to help the people in the province. They sent money to the Bangkok Post. cash donations came to over 800,000 baht and the Bangkok Post decided to use the money to rebuild the Ban Sapli School. The first building, which has full stationary equipment and eight classrooms for pupils from kindergarten through Pathom levels, cost about 1.4 million baht. However, the donations received were short of the required 1.4 million baht by about 500,000 baht, which was covered by money donated by Bangkok Post employees and board members. After the first building was completed, the Bangkok Post foundation further helped build an auditorium and first aid room. The foundation also built a pre-kindergarten room and renovated the school building its built 27 years ago as its latest aid to the school. Additionally, the Bangkok Post foundation has continuously offered scholarships to needy students since it first came to help the school to the present day. After the 2004 tsunami that devastated southern Thailand, which killed many local villagers and destroyed schools and homes, many Bangkok Post readers again donated money to the foundation. The foundation decided to use the donations to help children, whose parents died or missing from the tsunami, in Ranong province. Till today, the foundation continues to provide scholarships for these children to study to the highest level of education they can achieve. Children and youths obtaining scholarship support increased every year and the foundation would like to thank our donors and readers who help us to achieve our goal in helping the needy children. And one thing the foundation would like to assure the donors is that all the donated money will go purely for the cost of education with no administration cost deduction. After the 2011 flooding that inundated many provinces in the central , the foundation with the co-operation of the Black Mountain Golf Course in Hua Hin, Prachuab Khiri Khiri Khan helped rehabilitate schools in Ayutthaya, Pathum Thani and Nakhon Pathom in 2012. The foundation has provided more aid in the form of school building construction which continue until today. In 2013, the foundation restored five schools in Ayutthaya damaged by flooding the previous year, and built a library and a multi-purpose building in Hua Hin. In 2014, the Foundation expanded the multi-purpose building that it built a year before to be able to accommodate 350 students, It also provided fund to built a poultry-pen and a two– pre-kindergarten classrooms to two schools in Phetchaburi province. In 2015, the foundation added two more classrooms for the pre-kindergarten building it built for the school in Phetchaburi. 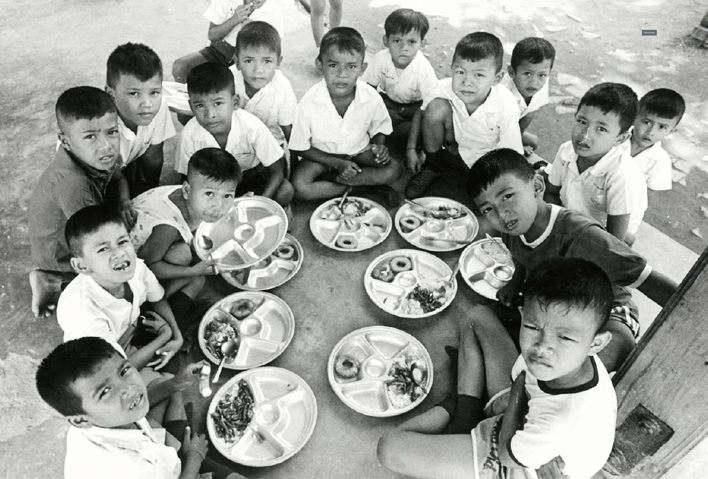 Help renovated the Ban Sapli (Bangkok Post Suksa) School building its built 27 years ago. The foundation also built a multi-purpose building for a Border Patrol Police school at Tambon Salalai in Prachuab Khiri Khan as well as expanded the roof of a school building in Chaiyaphum province so it can beused for students’ activities during rainy and summer season. Despite the past year’s economic difficulties, the Bangkok Post foundation has tirelessly sought to increase its support for needy children by organizing different fund raising events to supplement donations received from generous donors. The scholarships have helped fulfill many children’s dream to receive an education. There are still of course many more children waiting to receive your help.